Motorcycling through Big Sky Country - One of my favorite trips in the United States through Wyoming, Idaho and Montana. Throw in a few really great National Parks, wonderfully scenic roads, a geyser or two, some bears, great beef and raging rivers, and you've got a really great motorcycle vacation. 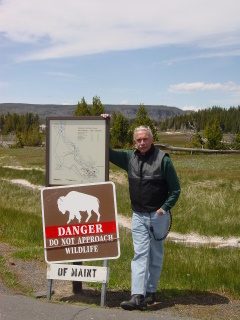 We started the trip by flying to Jackson, Wyoming, the first week of June. When we landed, it was raining and by the time we arrived in Jackson Hole, it was sleeting - then snow quickly followed. 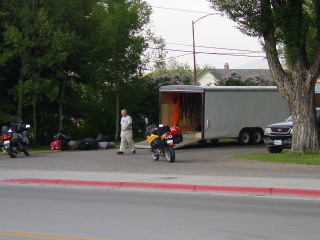 Once our motorcycles arrived on the truck, we traveled from Jackson to Yellowstone and the Grand Teton National Park. Fortunately, the weather changed for the better and we were blessed with sunshine and 70 degree temperatures. I appreciated now the timing of the vacation, as we were able to travel through the parks without the usual traffic - very few motor-homes and RV's to get around. 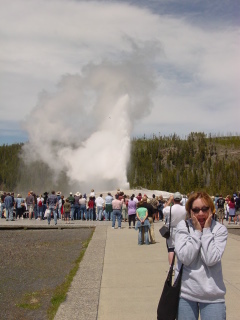 It was my first visit to Yellowstone, so I had to take in a showing from "Old Faithful." Definitely worth the wait - which I recall was a few hours. We spent a few hours riding through Yellowstone, and stoped quite a few times for "animal viewing" traffic jams. It apparently is customary to stop your car, minivan or RV, right in the middle of the road whenever a bear appears - for photographs. It's great fun to be on a motorcycle behind one of these parking lots. Once we finally figured out what was going on, we learned just to ride on. An alternate trip out of Jackson would have been to Cody, Wyoming on the Buffalo Bill Scenic Byway (Route 14/16/20), but due to mudslides, the road was closed. Next time, for sure. I wasn't really thrilled with the idea of sharing the roads with large furry, probably hungry, animals - fortunately, we did not encounter any - at least on the roads. We were warned to obey the speed limit when riding through Yellowstone - the National Parks are abundantly staffed by police officers during the summer months. Thankfully, we did not encounter any of them either. 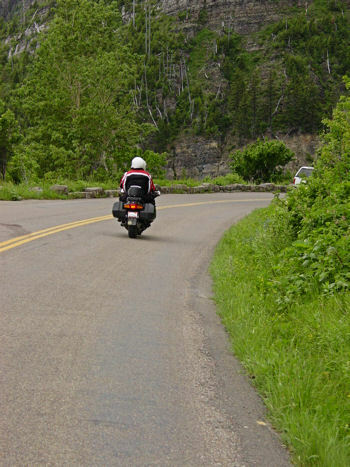 The roads in the park are well maintained, slightly curvy, and extremely scenic. There are waterfalls, and areas where you can see geysers of lesser magnitude than Old Faithful. From Jackson, Wyoming we traveled to Stanley, Idaho - through the rain and cold. Our route was Highway 20 through Idaho Falls, onto 20/26/93 to Carey, and then north on Highway 75 to Stanley. After 275 miles, we arrived in Stanley - where the sun was finally shining. We stayed at Redfish Lodge - no telephones, no TV, but it was wonderful. We each had a little cabin in the quietness, and ate our meals at the Lodge with the other campers. If you are ever in the area, stop in. I highly recommend Redfish! We stayed two nights, and I opted for a day off the motorcycle - to go for a little horseback ride. 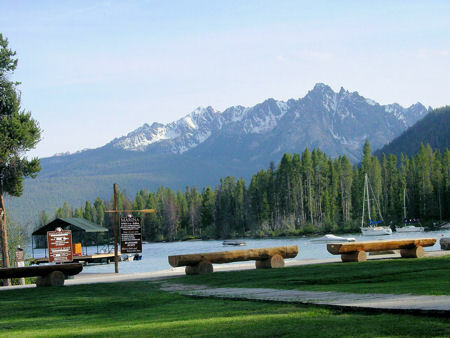 From Stanley, we traveled about 270 miles to McCall, Idaho - at the edge of the Payette National Forest. 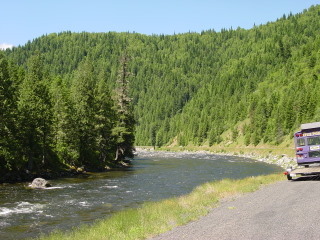 We rode yet another scenic byway - the Wildlife Canyon Scenic Byway, highway 27. An alternative route would have taken us through Boise and Horseshoe Bend. It was raining again as we rode into McCall, where we stayed at the Hotel McCall. We watched a wedding, had some wine and relaxed in lovely surroundings. Idaho is definitely more than just about potatoes - it is about great roads, beautiful scenery, great bargains, and history. From McCall, we traveled about 150 miles north to Orofino, our headquarters for the Northwest Passage - and the Lolo Pass. 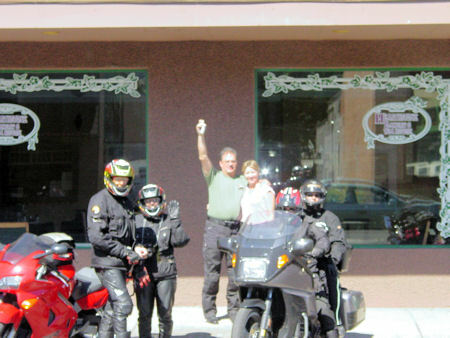 Orofino is a small town, with a bargain hotel and one restaurant - but we truly enjoyed our time there. 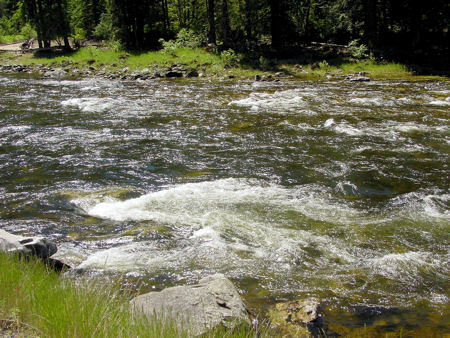 Make sure that you visit Kamiah for breakfast, and then on to Kooskia - and the Lolo pass.